Older ideas are always likely to get killed off by newer technologies. As soon as stainless steel became suitable for knives, the days of the knife cleaner were numbered. Nowadays, these items, designed to make knives look shiny, are confined to the shelves of museums. And we have one at Market Lavington Museum. You can find in the museum’s kitchen room. 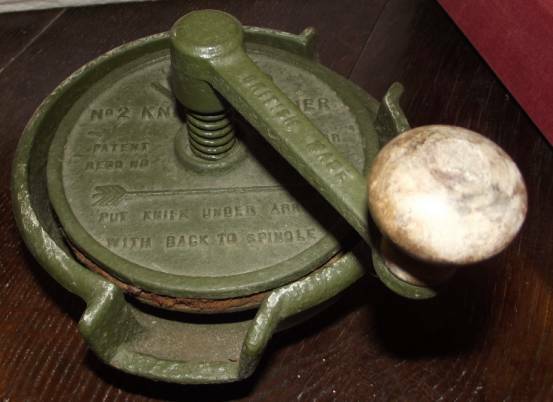 We think this device dates from about 1910. Handy instructions are provided in the iron casting of this knife cleaner. It was very simple – just shove the knife in between the pads, pressed together by the spring and wind the handle. 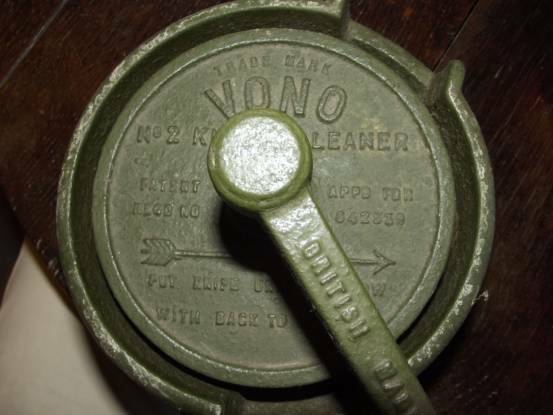 We can see that our knife cleaner (sometimes called a polisher) carried the trade name Vono and this was the number 2 knife cleaner. It was British made. This entry was posted on November 2, 2011 at 6:15 am and is filed under Museum. You can follow any responses to this entry through the RSS 2.0 feed. You can leave a response, or trackback from your own site.